The current economic and political climate places ever greater pressure on public organizations to deliver services in a cost-efficient way. Focused on the costs of service delivery, governments across the world have introduced a series of business like practices – from performance management to public-private partnership – in the belief that these will increase the efficiency of their public services. However, both the debate about public service efficiency and the policies and practices introduced to advance it, have developed without a coherent account of what efficiency means in this context and how it should be realized. The predominance of a rather narrow definition of the term – very often focused on the ratio of inputs to outputs – has tended to polarise opinion either for or against efficiency agenda. Yet public service efficiency, more broadly conceived, is an inescapable fact of the public manager’s task environment; indeed in the past, the notion of efficiency was central to the emergence of the field of public administration. 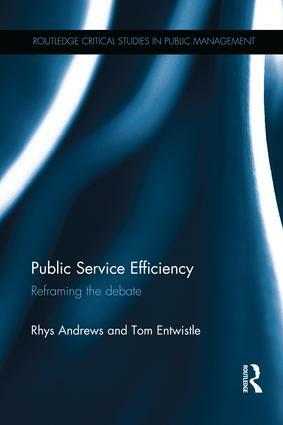 This book will recover public service efficiency from the relatively narrow terms of recent debates by examining theories and evidence relating to technical, allocative, distributive and dynamic efficiencies. In exploring the relationship between efficiency and democracy, this book will move current debates in public administration forward by reflecting on the trade-offs between the different dimensions of efficiency that public organizations confront.